This blog describes the possibility to influence the service contract determination with service contract attributes. The attributes which are available in the service contract and in the sales contract are described in my previous blog post. In the service contract it is possible to maintain covered objects at header level and on item level. With this attribute the relevance of the covered objects for the contract header determination can be influenced. In the drop down box the two values ‘Consider Header Covered Objects’ and ‘Limited to Item Covered Objects’ are available. With ‘Consider Header Covered Objects’ or if the field is empty, the covered objects of the contract header are used as matching criteria against the reference object of the ticket header. The meaning of empty covered objects at header level in this variant is that all objects are covered. The covered objects of the contract items are not considered. With ‘Limited to Item Covered Objects’, the covered objects of all contract items are used as matching criteria against the reference object of the ticket header. In this case the header covered objects in the contract must be empty. If one of the contract items has empty covered objects, then all objects are covered for the header determination in the ticket. In the BC for the contract document types the default value for this field can be assigned. 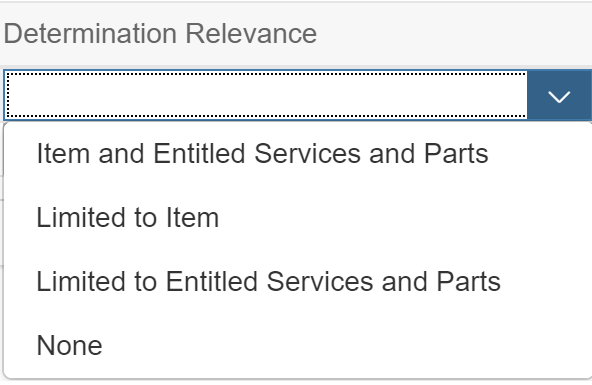 The service contract item has a product directly at item level and a list of entitled services and parts. With this attribute it can be decided which matching criterion is relevant for the contract item determination. The comparison of the item product in the ticket item depends on this entry. ‘Item and Entitled Service and Parts’: The product of the contract item and all item entitled products of the contract item are relevant. If no item entitled products are maintained, then all products are entitled. ‘Limited to Item’: The product of the contract item is relevant. ‘Limited to Entitled Service and Parts’: All item entitled products are relevant. If no item entitled products are maintained, then all products are entitled. ‘None’: The whole item is not relevant for the contract item determination. If the field is empty, the logic is the same as for ‘Item and Entitled Service and Parts’. In the BC for the contract item types the default value for this field can be assigned. For each contract item a list of usage restrictions can be assigned. In the ticket it is also possible to enter one usage restriction at header level and one for each item. For the contract header determination the entered usage restriction in the ticket header is compared with all usage restrictions of all contract items of a contract. For the contract item determination the entered usage restriction in the ticket item is compared with all usage restrictions of a contract item. A contract or a contract item is only applicable if the usage restriction of the ticket or ticket item is included in the list of the contract usage restrictions. If a contract or contract item doesn’t have usage restrictions, it is always applicable even if an usage restriction is entered in the ticket or ticket item The definition of the usage restriction codes is available in the BC for service contracts.